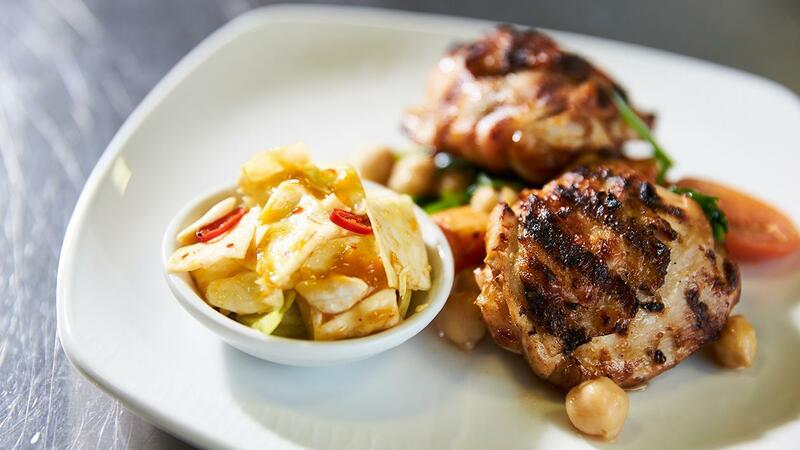 Try this classic grilled chicken recipe served with a selection of delicious vegetables. The marinated chicken is served with chickpeas, baby spinach and oven roasted sweet potatoes. Try out our Professional Piri Piri Paste for the great taste in the marinade. Peel the sweet potatoes and dice into 2cm cubes. Wash the baby spinach and drain. Cut the cherry tomatoes in half. Drain the chickpeas and rinse off. Trim any excess fat of the chicken thighs. Place the chicken thighs into a bowl and mix through the KNORR Piri Piri Paste. Leave to marinate for 3 hours prior to use in fridge. Blanch the sweet potatoes for 4 min., then drain. Whilst hot toss over 75ml of sunflower oil and place in a gastro tray. Roast in the oven at 180°C until lightly roasted. Add in the chickpea and continue to cook for 5 min. Remove from the oven and stir through the spinach and cherry tomatoes. Grill the chicken on the char-grill ensuring a good colour on the meat. Once thoroughly cooked remove from the heat. Place the roast sweet potato mix on the base of the plate and place the meat on top. Serve with a Piri Piri Kimchi.